The county has high vaccination rates, including 98.9% in public schools. With spring break coming, Nassau lawmakers and medical leaders are pushing families to get their kids vaccinated for measles before they hit the road — especially those traveling overseas. The alert, issued Thursday, comes after outbreaks in Brooklyn and Rockland County. 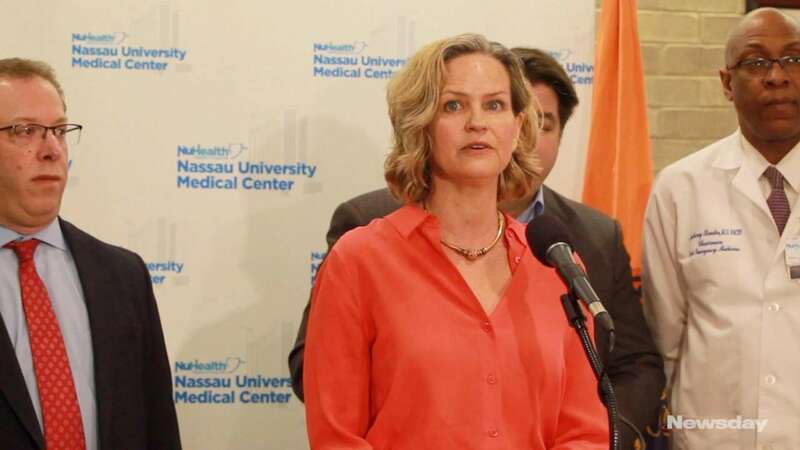 Though no Nassau residents have contracted measles since 2013, County Executive Laura Curran urged that all children be vaccinated. She also encouraged parents who have children who can't be vaccinated — either because they are too young or have compromised immune systems — to exercise caution. Children should get two doses of the MMR vaccine — MMR stands for measles, mumps and rubella, also known as the German measles, according to the Centers for Disease Control and Prevention. The first dose is timed around 12 to 15 months of age and the second dose should come at from 4 to 6 years of age. "We are on alert especially with expected holiday travel in the next couple of weeks," Curran said at a news conference at Nassau University Medical Center in East Meadow, the county's only public hospital that distributes free MMR vaccines. "The health and safety of our residents is always our top priority." Nassau has high vaccination rates for measles, including 98.9 percent in public schools and 97.3 percent in private schools, Curran said. But officials said there are still a handful of schools across Nassau with vaccination rates below the 96 percent goal set by the state. The lower rates are in schools where parents have used the religious exemption to opt out of taking the vaccine, state figures show. The schools include ones in Garden City, Old Westbury, Merrick and Long Beach. "In these schools a single measles case could expose our kids to a full-scale outbreak," said State Sen. Kevin Thomas (D-Levittown). "Parents have plenty of concerns when sending their children to school. Measles and other preventable diseases should not be one of them." Thomas is co-sponsor of a bill to end nonmedical exceptions for childhood vaccinations. Another bill would allow minors who are 14 years and older to get vaccinated without the need for parental approval. Roughly 30 vaccine opponents protested in front of Thomas' Garden City office last week. One demonstrator was John Gilmore, of Long Beach, a member of the New York Alliance for Vaccine Rights. On Tuesday, Mayor Bill de Blasio declared a public health emergency and ordered mandatory vaccinations in an ultra-Orthodox Jewish section of Williamsburg, Brooklyn, where 285 confirmed cases of measles have been reported since October. City residents who don't get vaccinated risk being fined $1,000. Nassau officials said they have increased their outreach to the county's Orthodox Jewish community but that the exemption rate is not significantly higher than in other communities. "We can prevent measles," said county Health Commissioner Dr. Larry Eisenstein. "The vaccine is safe. It is highly effective. It has been used for many, many years. And the science over and over and over and over supports that vaccination is the best way to prevent measles." Suffolk last reported a case of measles in 2017 after an individual acquired the airborne disease overseas, said Health Department spokeswoman Grace Kelly-McGovern. The county has a 98.4 percent measles vaccination rate for public schools and 90.4 percent for private schools, she said. Last month, Rockland County declared a health emergency to combat an outbreak of more than 150 confirmed measles cases. The CDC has reported 465 measles cases so far this year, compared with 372 in all of last year.